Remember a few months back I visited Vicki Sher’s studio? 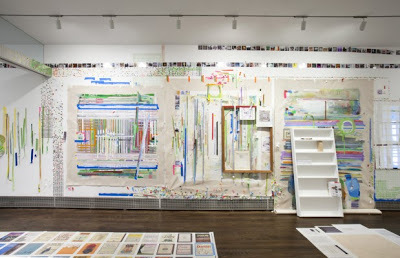 Yes/No, her thought provoking solo show at Frosch & Portmann (LES, New York), will be up through April 15, 2012. The exhibition includes paintings, drawings, and audio tapes that explore her grandmother’s loss of language. As she aged, Sher’s grandmother lost all her words except “yes” and “no,” but she communicated effectively nonetheless. On April 13, at 6 pm, Catherine Barnett and Michael Morse will be presenting poetry they produced in response to Sher’s work. According to the press release, the award winning poets will read together, alternately, echoing the rhythmic dialogue of the exhibition’s central audio piece. On the next street over, stop by Sue Scott Gallery (LES, New York) and check out Eyesontheedge, Franklin Evans’s robust installation that explores the roots of inspiration and ideas. The exhibition includes more traditional painting than his previous installations, comprising Xeroxes of book pages (highlighting and marginalia included), scanned images from family albums strung into a curtain, a low Plexiglas-covered bridge made of books from his bookshelves, and more. The fascinating exhibition is up through April 15, 2012. Franklin Evans, installation view at Sue Scott Gallery. 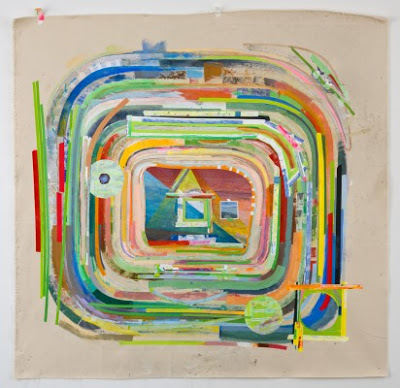 Franklin Evans, memorydoubled, 2012, acrylic on canvas, 72 x 72 inches. 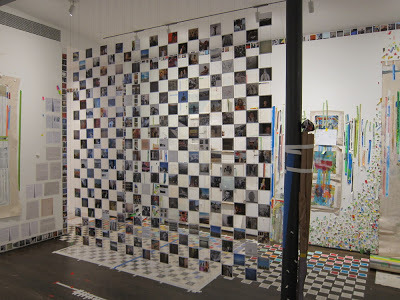 Franklin Evans, curtain of images, installation view. Subscribe to Two Coats of Paint by email.